While an unhappy series of battles, it was an enormous time of musical growth—and Jordi Savall’s latest book/CD compilation examines it in detail. NOTE: All of the music on this program comes from the release In excelsis Deo: Music from the time of the War of the Spanish Succession featuring La Capella Reial de Catalunya and Le Concert des Nations conducted by Jordi Savall. It is on the Alia Vox label, and is CD AVSA9924. Church music, court music and the historical memory of folk songs. 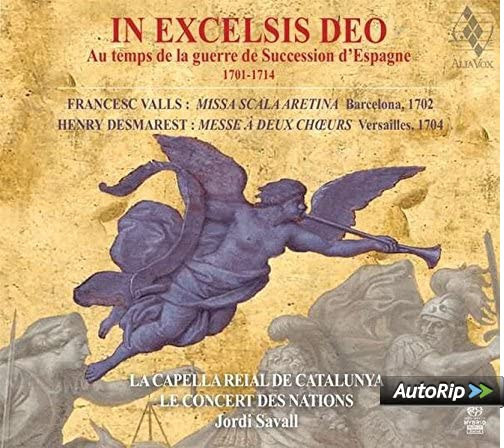 In this programme “IN EXCELSIS DEO” in the Time of the War of the Spanish Succession, two Masses, Missa “Scala Aretina” à quatre chœurs by the Catalan composer Francesc Valls (1671-1747) and Messe à deux chœurs et deux orchestres by the French composer Henry Desmarest (1661-1741), are presented side by side: two exceptional master-pieces which are linked in time and by the history of the nascent 18th century, but which are less well known than they deserve to be by today’s 21st century audiences. Indeed, these rare works, created by two of the greatest composers of Catalonia and France (they belong to the same generation, Valls being ten years Desmarest’s junior), are linked by the history of conflict between the French and Spanish crowns during the War of the Spanish Succession which began in 1701.Valls’s Missa Scala Aretina,composed in Barcelona at the end of 1701, was performed at the beginning of 1702, whilst Desmarest’s Mass was composed around 1704, just after his stay in Barcelona. The Missa Scala Aretina was performed for the first time at Barcelona Cathedral, whilst the Mass à deux chœurs was probably first performed at the Royal Chapel of Versailles (certainly after 1704, bearing in mind Philidor’s list of musicians taking part in the performance, in which he mentions the names of singers of the royal chapel and court instrumentalists). It was at the height of the terrible war between pro-Bourbon and pro-Habsburg factions in Spain and Catalonia, in which the Spanish and French troops supporting Philip V were pitted against the Catalan and Austrian troops of Archduke Charles of Austria, who were supported by the people of Catalonia in a bid to retain their freedom. The idea of bringing together in a single programme these two marvellous Masses grew out of our regular collaboration over the past several years with the Château de Versailles and Laurent Brunner, its artistic director and director of “Festival Château de Versailles Spectacles”. It was he who suggested the programme: sharing his passion for both French and Catalan and Spanish music, I immediately accepted the challenge with great enthusiasm. First of all, we set about considering how the project might take shape. To begin with, I had the support of the CIMA Foundation (Centre Internacional de Música Antiga),with whom we carried out all the necessary research, while with our chorus master, Lluís Vilamajó, we selected the vocalists (from La Capella Reial de Catalunya), and with Manfredo Kraemer, concertino of the orchestra Le Concert des Nations, we decided on the instrumentalists required in the line-up for each of the two works. The rest was possible thanks to an efficient collaboration with the team of the Saline Royale d’Arc-et-Senans cultural centre and the support of its director, Hubert Tassy. It was at the extraordinary venue of the Saline Royale that we carried out the musical preparation for the project (from 26th to 29th June, 2016), before performing the programme for the first time at Dole Cathedral on 30th June, and on 2nd and 3rd July, 2016, during the concerts given at the wonderful Royal Chapel of Versailles, during which our sound engineer, Manuel Mohino, made the live recordingfeatured on this CD. The life of Francesc Valls (1671-1747), unquestionably one of the most emblematic Catalan composers of the Iberian Baroque, poses some unanswered questions, particularly as regards his date of birth and his musical training. Albeit without any real evidence, it has sometimes been stated that he spent time at Valencia, Mataró and Gerona, but we do know for certain that he succeeded Juan Barter at Barcelona Cathedral, where most of his works were performed. A key composer of Catalan music and more generally of Spanish music in his day, his works reveal a familiarity with the new musical trends from France, Italy and Germany. The Missa Scala Aretina, which rapidly became the subject of a great musical controversy (see the accompanying article by Josep Maria Gregori), was for decades the most keenly debated religious work of any Spanish composer. Having supported the archduke during the War of Succession, he was cast aside by the new regime after the fall of Barcelona on 11th September, 1714. It is perhaps because of this desire for freedom that Valls’s music continues to be profoundly relevant today. He offers a deeply personal and intimate musical discourse projected with an overall expressive vigour that is deeply moving, combining grace and beauty in a seamless whole through a total fusion of melody supported by harmony and counterpoint. Henry Desmarest (1661-1741), one of the most talented composers of the reign of Louis XIV and Charpentier’s successor at the Collège des Jésuites in Paris, enjoyed his sovereign’s favour, both for his religious music (he had been a page at the Royal Chapel) and his operas. However, having decided to abscond with his sweetheart (who was then a minor) against the wishes of her father, he was condemned to death and forced to go into exile in 1699 to escape the death penalty. When, in 1701, the grandson of Louis XIV ascended the Spanish throne as Philip V, he appointed Desmarest Master of his Chamber Music in order to establish the Versailles style at his court, instructing him to recruit French musicians. And so Desmarest became Master of the French Music at the Spanish court. No sooner had he arrived in Madrid in June, 1701, than Desmarest was called to follow his king to Barcelona for the monarch’s marriage to Maria Luisa of Savoy. He remained there, together with a dozen French musicians, from August to the end of December 1701, to provide entertainments at court. It was about that time, in late 1701, when Francesc Valls, the famous chapel master of Barcelona Cathedral, performed his Missa Scala Aretina. No doubt Desmarest had the privilege of hearing this sumptuous Mass, as well as meeting Valls either on that occasion or later, in 1702, during his stay in Barcelona. However, fate was soon to deal the exiled composer a blow: Philip V returned from Italy with a marked fondness for Italian musical tastes and decided to disband his French Music, whose musicians then had to find employment with the various orchestras of the music chapel and the court. Buffeted like his king by the constant military twists and turns of the War of the Spanish Succession, at a time when the Royal Chapel in Madrid was undergoing transformation and in the midst of political manoeuvring, Desmarest was left without any secure position until 1707, when he was called upon to serve at the court of Lorraine. He was appointed Superintendent of Music at the court of Leopold 1, Duke of Lorraine, at Nancy, and it was in Lorraine that he would spend the rest of his career and end his days. There he premiered his splendid Mass for two choirs and two orchestras (1707), which was probably composed in Spain, inspired by local composers and, no doubt, by Valls’s Missa Scala Aretina. This extraordinary Messe à deux chœurs et deux orchestres reveals the full extent of Desmarest’s genius: a spectacular command of counterpoint and harmonic sequences; an impressive architecture in the different parts of the Mass, alternating with admirable symphonies in which the two orchestras are brought together to open the Kyrie, the Sanctus and the Agnus Dei; moving contrasts between the choral declamation of texts in the passages of the Gloria; between Adoramus te “Slow” and Glorificamus te “Quick”, as well as during the Credo; between Simul adoratur “Slow” and et Conglorificatur “Quick”, and at the end, between Pleni sunt cæli et terra “Slow” and Hosanna in excelsis “Quick”, not to mention the overwhelming Crucifixus and the moving, polyphonic 8-part fabric of Et incarnatus est. To complement this Valls CD, we have added “Music from the Time of the Wars between Spain and Catalonia”: first, “Batalla Imperial” by Kerll/Cabanilles, which serves as an introduction to three ancient songs sung by people in Catalonia during the same period in which Valls’s and Desmarest’s Masses were performed. These are the songs of the memory of a people, music that evokes the lives and aspirations of men and women who, risking their lives and all their possessions, had the courage to defend their culture and their freedom.